An important factor in the success of any small business is making sure potential customers can find key information online in a quick and convenient way. Many people are not willing to enter a website when searching for a business, so registering with Google My Business can be a good way for you to manage your online presence across the search engine for free, so that you are easily found and stand out from competition. If you are unsure whether Google My Business is right for you, here are some benefits it can have for small businesses. When people are searching for a local business to purchase or hire a service at that exact time, they often add ‘near me’ to the end of their search query. Whether it’s on a mobile, tablet or desktop, Google My Business can help you show up in a map format and in typical search results. Another factor to consider is that Google is a widely trusted and well-respected platform to represent yourself on. This is amplified by the fact that people can leave reviews, which can have a huge influence on a potential customers first impression of your business. Encouraging clients to leave reviews will increase trust for your business and improve search engine performance. Google My Business allows you to track analytics data, enabling you to learn more about your customer and gain insights into how they interact with your business listing. Examples of this include finding how people found you, where they are searching from and which photos are attracting the most attention. These tools can be essential in developing strategies to attract new customers and grow your business. Businesses with a Google My Business account are given better real estate on the search results page, attracting more attention from potential customers. 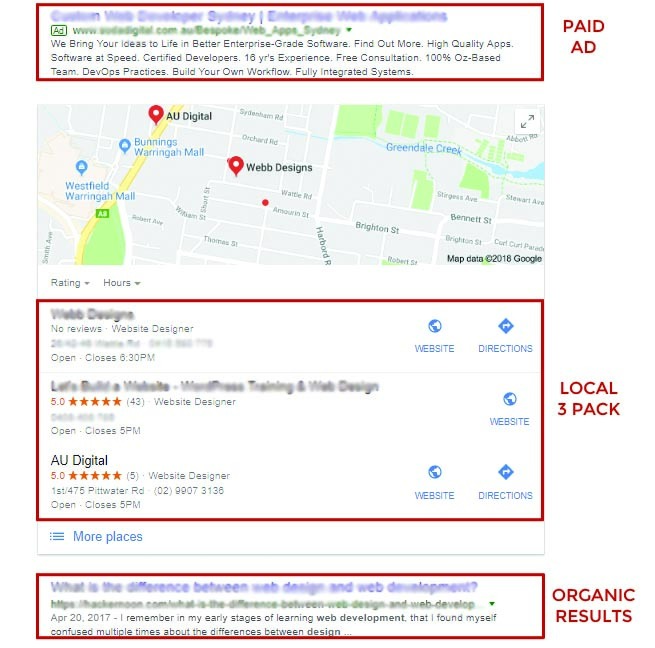 When customers perform a local search, the first results that typically appear are reserved for paid ads. These are followed by a map and information about businesses in that area. This is where your small business appears once registered with Google. These listings are extremely important for small businesses to display vital information such as opening times, location and phone number. Google My Business gives local businesses a great chance to fight in a competitive market environment. Its free, easy to use, and can make a big impact on the success of your business by increasing awareness and providing customers with relevant and helpful information. If you still don’t have an account head over to Google My Business and click Start Now. If you need solutions for your online strategies AU Digital can work with you to provide the best course of action for your business! Get an online quote here or call us today on 9907 3136!